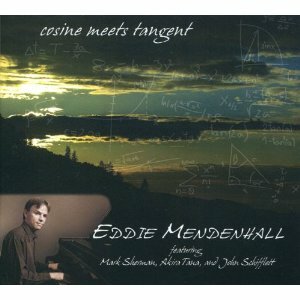 A lush harmonic beauty exudes from Cosine Meets Tangent (Miles High Records), the debut recording from Monterey teacher and musician, Eddie Mendenhall. Absorbing a scene that crosses both Japan and the U.S., Mendenhall has developed a voice that is disciplined, rhythmic and entertaining throughout the course of this session. This is a fresh and very inviting album that has shades of some of the legendary and entertaining sessions from the likes of Hank Jones, Cedar Walton and more recently Cyrus Chestnut or David Hazeltine. Mendenhall's approach is a straight forward bop sound that can be both intricate and accessible to new & old jazz fans alike. "Protocol" opens with bounce from both Mendenhall and Sherman who make sure to grab the listener and bring them right into the rhythm. Sherman doesn't stretch like some the more avant garde vibraphonist but he makes the best of influences like Bobby Hutcherson and Milt Jackson. And that makes "Protocol" all the more rewarding. 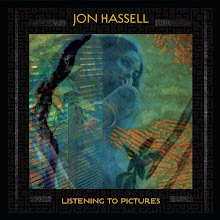 "Rain Hike" sees Mendenhall telling a story and taking the listener on a journey which encompasses not just his jubilant take on the keys during the solos but also a passionate demonstration by his band. Sherman and Schifflett have some impressive performances as well, and Tana slides gently underneath with superb timing but without it this track becomes more a jam than a hard driving piece of modern bebop. "Lament For The Ocean" is a passionate soliloquy (written in response to the BP oil spill crisis) which Mendenhall really delivers his best performance. It's introspective but warm and inventing enough that you really are affected by it with a real sense of urgency. One of my favourite tracks on the album. The closer and title track is more complex than you would originally think considering how free and open the rest of the album is. "Cosine Meets Tangent" is brisk with some great harmonic structures and improvised moments that stretch the quartet more than the rest of the proceedings. It definitely shows the strength of the band. Schifflett gets a great opportunity to let rip and has some terrific conversation with Mendenhall through the middle of the piece. The builds to a quick yet festive conclusion which keeps in the tradition of outing. Cosine Meets Tangent is a great debut from a talented musician and teacher who has a lot to share and stories to tell. It might be a difficult record to find but if you come across it either online or at your local record store, it is well worth the price. Enjoy the experience.